Did You Spot The Pothole Gardener? Kyra Hanson Did You Spot The Pothole Gardener? 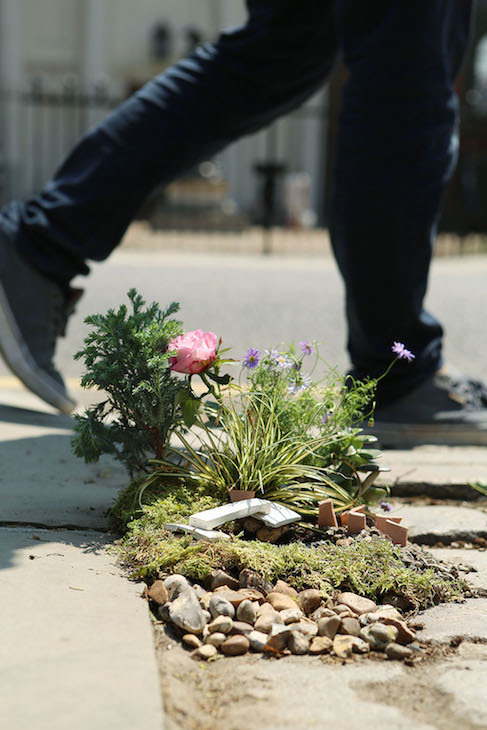 If you were enjoying a walk along the South Bank or out and about in Chelsea or Brixton today, you might have noticed the floral bursts of colour sprouting out of the potholes that blight the city's paths and roads. 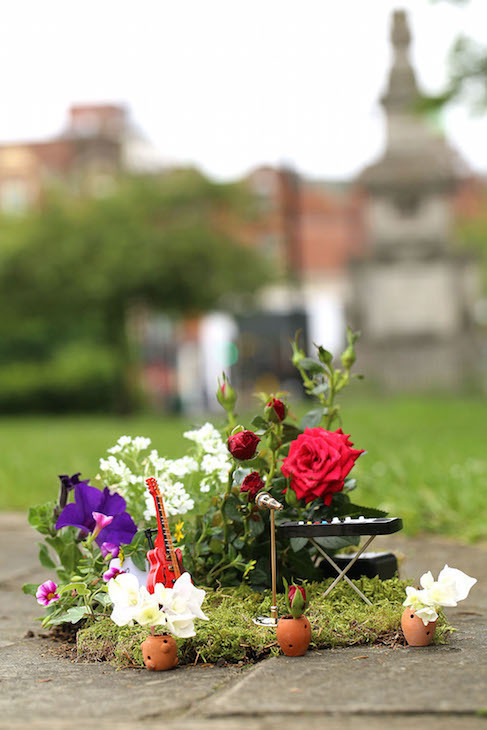 These miniature gardens are the work of Steve Wheen aka the Pothole Gardener. 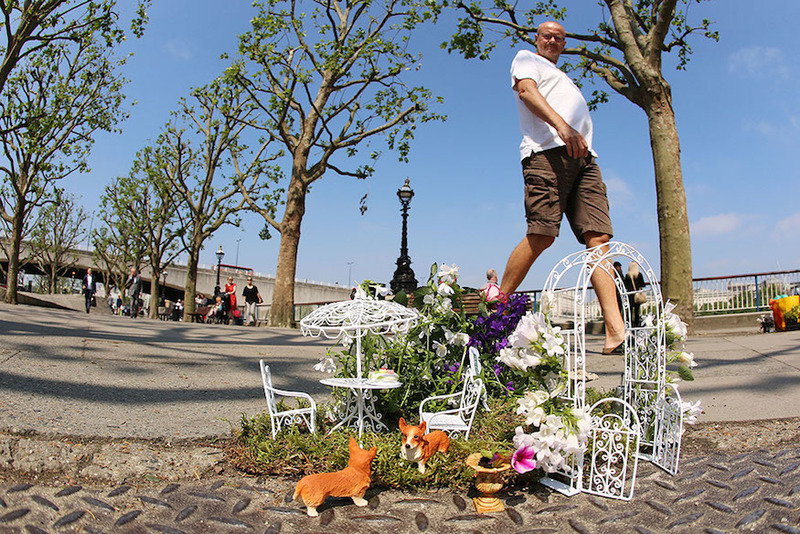 After a scuffle with the security near OXO Tower, Wheen got to work on his latest commission outside the National Theatre, a pothole garden to mark the Queen’s 90th birthday — hence the corgis. Next stop was Chelsea, where he recreated a miniature version of The Telegraph Garden, which won Gold at this year’s Chelsea Flower Show. The original was designed by Andy Sturgeon. It’s all part of his happiness project; Wheen takes time out his job working for a creative agency to make people smile. Such is city life, we rarely take the time to look up from our phones to notice the small, unexpected things, which could make the daily nine to five just that bit more bearable. These floral patches of joy are certainly conversation starters. Wheen says, "this is actually one way where you see people connect, they'll stop and look at the garden, turn to someone and smile, that's what it's all about. "Working in miniature is always a challenge" but, he says, "there's something about the scale, especially with adults, that unlocks their imagination, reminds them of their youth and sets them on their journey with a different trail of thought." The planting for all three gardens was inspired by the range at The Joy of Plants, who want to inspire Londoners to be creative with their outside space. Each garden is carefully constructed. He even makes his own props, but he isn’t precious about them. At the South Bank today Mothers stopped with their prams, and toddlers were quickly engrossed with the corgis. It’s inevitable that traffic, people or pollution will lead to the garden’s demise — once a bus driver tried to run off with one. It's exactly that ephemeral nature of the pothole garden which motivates him: "Some of them last a long time, some of them don't, but that's OK, it's about being in the moment." "People are always tweeting me asking me where the next one is going to be, but it's not about hunting one down, it's about the surprise of coming across one. Flowers make everyone happy, and London needs more happy people"